If you thought large capacity coolers (24+ bottles) are inevitably doomed to using power-consuming compression-based cooling technology, this Koldfront 24 Bottle Single Zone Wine Cooler review will open your mind up to a whole new world of possibilities. Read on to find out exactly what a combination of thermoelectric cooling and a sizable 24-bottle capacity means for your wine cooling prospects. This is another top rated wine cooler which bears the Koldfront 7-Series DNA in its stylish design that translates into efficient operation. It’s as much about wine presentation and display as it is about the outward appearance of the cooler, wherever you’d choose to place it. This is achieved through some stainless steel trimming to go with the tempered glass fitted on the cooling compartment door. This encases a cooling compartment interior that houses wine bottles on stylish, black, wood-finished cabinetry. 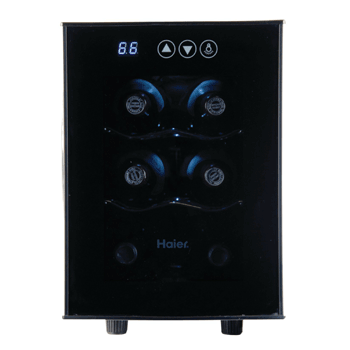 Featuring refined wooden shelving, a safety lock and an LCD temperature display (and control panel), this single zone thermoelectric wine cooler comes with a one-year parts and 90 days labor warranty. The use of thermoelectric cooling technology in a 24-bottle cooler is unusual but simply equates to more energy efficiency and quieter operation than what is typically expected of a cooler of this size and capacity. The cooler weighs in at 48 lbs and occupies a volume of 31.7″ (H) x 14″ (W) x 20.1″ (D). The adjustable thermostat and internal temperature is responsive and intuitive enough, but as is expected of thermoelectric coolers, ambient air temperature of the room plays a part in the unit’s ability to maintain a consistent internal temperature. Nobody could ever complain about the capacity of a 24-bottle wine cooler from Koldfront, especially if that capacity includes the ability to store bigger bottles such as those of your Champagnes. Just some reconfiguration of the shelves is required to easily fit the bigger bottles. In action, though, thermoelectric cooling comes to the fore once again in this cooler, delivering some effective cooling that is efficient in its use of energy and outputs little to no vibration. The single temperature cooling zone has an impressive range of between 46 and 66 degrees Fahrenheit, but what is considerably surprising about this unit is how quickly it cools bottles down to the desired temperature. Normally this type of cooling speed is associated with compression-based coolers and not thermoelectric coolers like this one. The fact that a 24-bottle cooler and its associated size actually uses thermoelectric cooling technology as opposed to compression-based cooling is in itself quite a surprise. For such a large-capacity cooler, it’s also surprisingly versatile; two rear-facing fans that are slightly elevated from the ground means it can even be placed on surfaces such as carpet floors. It’s made for freestanding application, but if an under-counter area you might want to put it in has enough clearing space all around, it’ll look very good in such as setting. 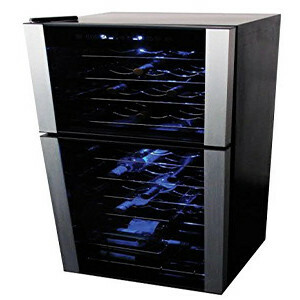 The important thing is adequate ventilation, but it must be emphasized that this is meant to be a free-standing wine cooler. Now, hopefully, you’ll never have to uncover this feature of this cooler for yourself, but we found that in sweltering temperatures that soar up to 90 degrees, it experiences a bit of trouble maintaining the 55-degree mark. That’s a general drawback of thermoelectric cooling, however (dependence on ambient room temperature) and it perhaps seldom gets that hot anyway. Avid wine enthusiasts whose growing love for wines has them needing a good way to store their growing collection will love this wine cooler. If you’re looking in and around the 24-bottle range, this Koldfront 24 Bottle Single Zone Wine Cooler review will have undoubtedly covered your most important considerations. 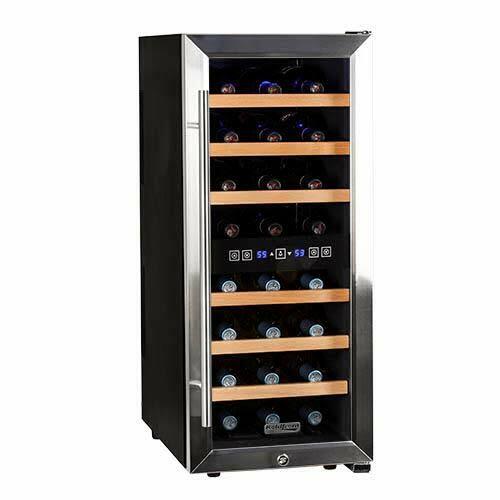 In a few ways (mainly with regards to the capacity) this cooler is a step up from its 18-bottle little brother from the same manufacturer (Koldfront 18 Bottle Free Standing Dual Zone Wine Cooler – Black and Stainless Steel). You’ll have to make do with a single temperature zone though as opposed to two cooling zones. To sum it up however, what you get for your money is a very beautiful wine color that works as well as it looks. Competent temperature maintenance (if housed in the right environment) and in our experience, it operates quietly. The slight fan noise is negligible and can only really be heard if you listen closely and if your house is dead quiet.